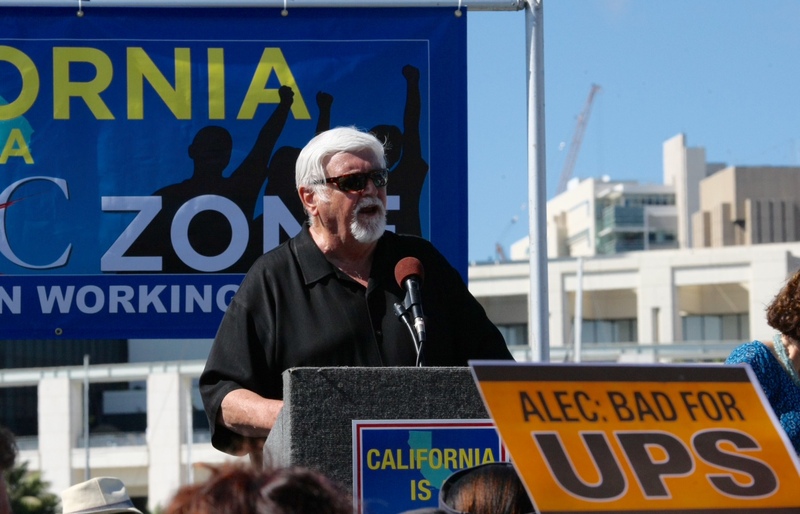 Joint Council 42 President Randy Cammack calls on UPS to leave ALEC. UPS Teamsters have for years asked the package delivery giant to end it's affiliation with the virulently anti-union American Legislative Exchange Council (ALEC). And yesterday in San Diego, hundreds of them from throughout California came to a national meeting of the organization to have their voices heard. There is a UPS representative inside attending the meeting as we rally out here. Let's make sure she can hear what we have to say -- UPS, get out of ALEC! UPS, get out of ALEC! UPS, get out of ALEC! The Teamsters represent more than 250,000 members at UPS and UPS Freight. While more than 120 corporations and organizations have left ALEC due to their controversial positions, UPS remains an active member of ALEC despite the organization's anti-worker agenda that seeks to undermine and weaken worker positions. UPS might be obligated to encourage union involvement among its workforce, but uses part of its profits to push for so-called "right-to-work" laws in states around the nation. ALEC has served as a legislative clearinghouse which authors model bills that are often brought to state capitals by lawmakers and introduced as-is. The group also acts to connect lawmakers with corporate big-wigs. It is funded, in part, by billionaire industrialists the Koch Brothers. These legislative schmoozefests, for instance, have resulted in more and more states introducing preemption bills that stop localities from raising the minimum wage in their jurisdictions or offering paid sick leave. Big business relishes such laws. Workers pay the price for their greed. Global corporations like Coca Cola, Apple, McDonald’s and even Walmart have decided that continuing a relationship with this toxic organization is too damaging to their brand. It begs the question of why UPS, the largest unionized company in America, continues to associate with ALEC. It’s time for UPS to do the right thing for its workers and cut ties with ALEC. Celebrate the Teamster way on the Fourth!